A belated link to the episode of Sunday Miscellany that was recorded live as part of Culture Night. I’m delighted to have had two poems featured. You can have a listen back here. We recorded the episode in Dublin Castle in the midst of the RTE Festivities. There was a great buzz around the place and I stuck around for the Poetry Programme too to hear Elaine Feeney, Doireann Ni Ghriofa and Dave Lordan read. 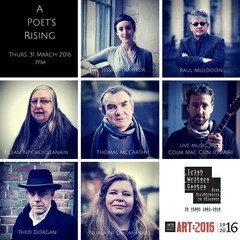 I was really delighted to be commissioned as part of ‘A Poet’s Rising’, one of the Ireland 2016 projects. The Irish Writer’s Centre commissioned myself, Theo Dorgan, Thomas McCarthy, Nuala Ní Dhomhnaill, Eiléan Ní Chuilleanáin and Paul Muldoon to write poems in response to the experiences of the leaders of 1916, set at various locations around the city. I write mine about Dr Kathleen Lynn in City Hall. We launched our poems on the 31st March at the Irish Writer’s Centre, and the accompanying documentary (featuring all the poems with beautiful accompaniment from Colm Mac Con Iomaire) will be broadcast on RTE on the 19th April. Eiléan Ní Chuilleanáin’s poem ‘For James Connolly’ was the first to be recited to a spellbound audience at the Irish Writers Centre in Parnell Square, Dublin, last Thursday night. I found these opening lines deeply moving – they brought me right back to when I was ten or eleven and read my first adult biography. It was a portrait of James Connolly, one that concentrated on the family man, the deeply compassionate human being whose sense of fairness and decency was outraged by the appalling poverty in which the ‘common man’ – and woman and child – were living. I thought that Eiléan Ní Chuilleanáin’s lines captured that sense perfectly – the sense of a man tired of waiting for ‘the voices to shout Enough’. ‘For James Connolly’ is one of six poems commissioned by the Irish Writers Centre and supported by the Arts Council as part of the national commemoration of 1916. The six poets concerned are Eiléan Ní Chuilleanáin, Paul Muldoon, Jessica Traynor, Nuala Ní Dhomhnaill, Theo Dorgan and Thomas McCarthy. Each poet focused on a key historical figure and a particular location associated with the Easter Rising. Paul Muldoon ‘ventriloquised’ Patrick Pearse. Jessica Traynor chose Dr Kathleen Lynn, Nuala Ní Dhomhnaill the O Rathaille, and Theo Dorgan paid tribute to Elizabeth O’Farrell. All of the poets were then filmed in their chosen locations and the film will soon be an app, freely available for download at the end of April. Conor Kostick has written the historical links between each of the poems on the app, and the glimpses that the audience got of the final version were enticing. As the poets are filmed reading their work, they are accompanied by the fiddle playing of the incomparable Colm Mac Con Iomaire. Colm composed a haunting score in response to the poets’ commissioned work. We, the audience on Thursday night, were privileged to be in attendance as he played ‘Solasta’ for us. It was illuminating to focus on the humanitarian motivations shared by so many of those involved in Easter 1916. Not an ill-advised pageant or a national barricade. This was a memorable evening on so many levels. Congratulations to the Arts Council, to the Irish Writers Centre – particularly to Pádraig Burke, the Development Officer there – to Colm Mac Con Iomaire, to Conor Kostick and, of course, to all the poets involved. I made my way home through the Dublin evening afterwards feeling uplifted, grateful, almost optimistic.